To Elsa on the "Ships starting with E" page. Built in Glasgow in 1928. A Guestbook message from the daughter of someone who served on Elsa from Oct.-1939 to Jan.-1942, Kristian H. Buen. He later served on Sophocles. If anyone knew him, I can provide her E-mail address via my contact address given at the bottom of this page. Warsailors Stories - John Simpson's story about his time on board Elsa, as well as Troja and Tiradentes. Forum thread - Re. the location of Elsa's sinking. Previously traded I Ocean & Australia. As can be seen when going to Page 1, Elsa was in Australian waters when war broke out in Norway on Apr. 9-1940. Her 1941 voyages also start on this document and continue on Page 2, which also shows her 1942 voyages. Elsa was one of four Norwegian tankers in Convoy MS 3 which had departed Fremantle for Palembang on Jan. 30-1942, but were ordered to leave Palembang because of the expected Japanese attack. The others were Erling Brøvig, Herborg and Seirstad (M/T Erling Brøvig has more details). Elsa made it safely to Batavia on Febr. 14. In the morning of April 6-1942, Japanese warships under Admiral Ozawa attacked and sank 19 ships between Cocanada and Vizagapatam (India) in a matter of just a few hours. 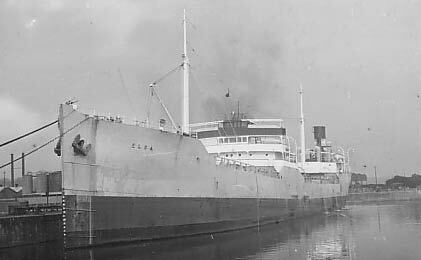 M/T Elsa was en route from Madras to Calcutta with 7000 tons kerosene, having departed Madras on Apr. 3. Her armament consisted of one 3" gun placed aft, 2 machine guns on the bridge and 2 "ordinary" guns. She was 35 n. miles east of Cuttack when the 1st mate spotted 3 naval vessels at 06:00 on Apr. 6 (this location has been questioned - please see the messages in this Forum thread - see also this external thread). He immediately notified the captain who came to the bridge, and when one of the vessels signalled for the ship's name, the captain gave it, thinking the ships were British. At that same moment they opened fire. The crew ran to the lifeboats, launching the port and starboard boats as well as the gig while the shells were raining around them. 1 was killed and several injured. The 29 survivors reached land south of False Point the next morning. The locals gave first aid to the injured, before they were all sent to Cuttack where the wounded seamen were admitted to a hospital while the others were accommodated at Cuttack College. On Apr. 8 they were sent to Calcutta. Steward Håkon Williksen, Skien (injured by shrapnel, in the hospital for a long time). Cook Ingolf Madsen, Odda (injured). 2nd Cook Ivar Pedersen, Fiane (injured, further injured by poisonous vegetation during their march to a populated area 43 km from their landing point in the lifeboat). Deckboy Willy B. Olsen, Kvinedal (injured) and Bjarne Hansen, Vikedal. The 1st mate and the 3rd mate were also injured by shrapnel in the attack (named in the crew list below). Bjarne Hansen has an article in "Krigsseileren, Issue 3/1982. He was at the helm when the first shell hit them at about 06:30 that morning, followed just seconds later by another, then a third. Oil was pouring out from her sides. By the time those who had been on the bridge reached the motorboat on the starboard side another shell hit, destroying the boat. They ran to the port side again and launched the gig while the shells were flying around them. In the meantime some others had lowered and gotten into the port lifeboat but many had to jump into the sea. The gig fished several out of the water, including the captain. Those remaining on board succeeded in getting the starboard boat on the water just as Elsa was set ablaze, and shortly thereafter the oil covered water was also on fire so they had to row for life to get away from the flames, and in doing so the 3 boats got away from each other. The gig reached one of them, then transferred an injured man into it for transport to shore as quickly as possible, while the gig was rowed towards the 3rd boat which was further away with 3 men, reaching it in 20 minutes, whereupon they all transferred to the bigger boat before heading for land. At this time they found the chief engineer to be missing. After a long while one of the men happened to look towards the abandoned gig, and noticed what looked like a person standing upright. They turned around to investigate and there was the chief engineer who had been in the water for about 3 hours and was about to give up when he had spotted the gig and managed with the last of his strength to swim the long distance from the ship and get into it. Elsa continued to burn until she finally went down late that afternoon. The boat reached land the next morning where they met up with the others. 1 man was missing. The survivors later came to Calcutta where they stayed for about 10-12 days before joining other ships. "By April 1942 I was on board the Elsa, a Norwegian tanker, in the Bay of Bengal. We had made several trips from Australia to Sumatra and Singapore, evacuating stocks of aviation fuel from Singapore to the Dutch East Indies ahead of the advancing Japanese. On the last of these voyages the Japanese got to Singapore first, so we diverted to Sumatra. We loaded at Palembang in Sumatra and headed for Batavia, Java (what is now called Jakarta). We were in a convoy of six Norwegian tankers. Three were sunk and two others were hit by Japanese bombers. We were the slowest ship, but we were the ones who got through to Batavia unscathed. After unloading the fuel, we set sail for the Persian Gulf via Sundra Strait, arriving at Abadan. (Again, see also Erling Brøvig and Page 2). It was dawn. I woke up to the noises of shellfire. I looked out towards the horizon and saw guns flashing on a Japanese cruiser. I actually saw holes appearing in the decks, as the shells were arriving quite accurately. I was on the starboard side at the after end of the ship, with the accommodation block ahead of me. I went that way to see what was going on, and saw the holes appearing, from the shells landing at a flat angle and going through the deck and out the far side. Meanwhile the Second Mate was organising the lowering of the lifeboat. It all happened so quickly. The main concern was to get off this explosive vessel. Fortunately we were not carrying aviation spirit on that occasion - the ship had been condemned in Abadan for carrying aviation fuel, and they loaded power kerosene, six thousand tons, and we had discharged some at Colombo, and some at Madras. The rest was for Calcutta, but we never got there. In the final count of heads on the two boats, there was just one man missing, the brother of one of the Norwegian sailors. We can only assume that he went back to his quarters - he had been the lookout - and he was past saving. We were told not to go back to the quarters, so I was in the boat in my pyjamas. I had nothing with me at all. But it didn't matter. Nobody salvaged anything. The captain and the mate and the Third Officer got away from the bridge in the captain's gig, a small boat, along with the chief steward. The port boat got away with some men in it, and the starboard boat had most in it; there was enough room in any boat for the whole of the crew, either port or starboard. We got clear of the burning vessel, and in the head count the Chief Engineer was missing. They decided to set the captain's gig adrift and use the port lifeboat as a sturdier option, and had moved off about a mile when they saw something moving in the gig. The Chief Engineer had apparently dived overboard at the last minute and managed to reach the gig. He was an old chap, about 60. The explanation for him being there so late was he was looking for his dog. The dog, of course, was terrified and had gone and hidden somewhere and he couldn't find it. Eventually he realised he had to leave it or die with it. So he lost his dog, and he was very upset about that, but he was in one piece. When the attack was over the Japanese ships steamed past us with all the ratings lined up on the deck as if they were on review. Fantastic. We all thought they would machine-gun us for sure, the Norwegians thought that, and everybody started holding the gunwale of the boat, watching for the machine-gun fire, because you can see the shots landing before the bullets get to you, all ready to dive into the water. But nothing happened, which I thought was very good. There were 60 ships sunk that day in the Bay of Bengal. We sailed overnight. Just before dark we sighted land. Of course, we couldn't risk going in during the night, so we put the sea anchor out and rode the night out offshore. With daybreak we could see what we were doing, so we rowed the boat in like a surf boat and everybody hopped out onto the beach. We had landed in the state of Orissa, in North-East India. The only serious injury among us was the mate, with a big lump of his face blown off by shrapnel. We improvised a stretcher and carried him in turns, and the natives, the Indians, directed us walking inland through what was pretty much jungle - I saw a cobra hanging in a tree - until we were eventually picked up by transport, lorries, and taken to Cuttack, the capital of Orissa, and put up in the university and given food and clothing. They seemed to be well organised, the Indians, and I was given khaki shorts and a shirt and underwear. The next day we were sent by rail to Calcutta, where we were put up in the Grand Hotel on Chowringhee. We were there for about three weeks while the port was closed due to enemy action. Then we were sent over to Bombay, a two-day journey. In Bombay we were put up at the Norwegian Seaman's Rest Home, a delightful place north of the racecourse. I was given the option of returning to the UK or to the place of embarkation, which was Australia. So I opted to return to Australia to see my girlfriend! We got paid, by the way, during all this hassle. We got paid. The Chief Steward did the wages, the accounts, for everybody. He had to estimate what you were owed, and on his say-so they paid out that amount. There were no delays, you had money in your pocket." (The rest of his story is about his service on Troja and Tiradentes). The maritime hearings were held in Calcutta on Apr. 16-1942 with the captain, the 2nd mate, Able Seaman Hansen (helmsman) and Able Seaman Svendsen appearing. Other Norwegian ships sunk by the same Japanese forces on April 6 were M/S Dagfred and D/S Hermod. See also D/S Soli for some background history. *Again, see John Simpson's account in my Warsailors Stories section. The 2 men denoted * were brothers. It appears Thorbjørn Svendsen, who had been on lookout duty in the mast when the attack occurred, was last seen by his brother when he (Thorbjørn) was checking the cabins aft to make sure there was nobody left there. It was believed he had not been able to make it up on deck before the ship was set on fire. In her book "Tusen norske skip" (1943) Lise Lindbæk included an interview she had with a Swedish seaman who she says was on board Elsa at the time of the Japanese attack, but the details sounded almost exactly like those given in the captain's report for M/S Dagfred so I've added a very brief summary under that ship instead. Stavern Memiral commemorations - The second one listed, 3rd Mate/Radio Operator Harald Utne died in an accident (drowned) on May 11-1940. According to Page 1, Elsa was on her way from Colombo to Bahrein on that date. Back to Elsa on the "Ships starting with E" page. Norway (Wilh. Wilhelmsen) had a steamship by the name Elsa in WW I, built 1904, 3581 gt - torpedoed and sunk by UB 31 off Berry Head on Jan. 24-1918 on a voyage from Sourabaya and Cardiff to Christiania with general cargo and coal. (Denmark also lost a ship by this name in WW I). The text on this page was compiled with the help of: "Nortraships flåte", J. R. Hegland, "Krigsseileren, Issue 3/1982, "Tusen norske skip", Lise Lindbæk, "Sjøforklaringer fra 2. verdenskrig", Volume I (Norwegian Maritime Museum) and misc. - ref. My sources.